Does speeding increase crash risk? How does speeding increase crash risk? Does speed increase the severity of a crash? What are common characteristics of speed-related crashes? Who is most likely to speed? What influences young drivers to speed? What are the economic costs associated with speeding? What do Canadians think about speeding? Why do a majority of Canadians still speed? What reasons do young drivers give for speeding? Are there federal speeding laws? Are there provincial and territorial laws for speeding? What can be done to reduce speeding? 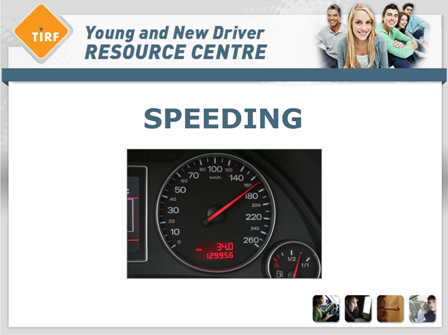 What anti-speeding campaigns and programs are available for young drivers? Yes. There is very strong evidence which shows that speed increases crash risk. For instance, a 1% increase in speed increases a driver’s fatality risk by 4%-12%. An increase of the speed limit by 25 km/h on a road increases the fatality rate of drivers by 10%.13 The risk of being involved in a severe crash is twice as great at 65 km/h than it is at 60 km/h.14 We can conclude from these statistics that even a small increase in a driver’s speed can lead to a much higher crash risk, which shows how important it is to respect the posted speed limits and to adjust your speed according to road conditions. Yes. As a vehicle travels, energy is created and the faster a vehicle travels the more energy it produces. The vehicle is designed to absorb this energy in the event of a crash, but there are limits to how much a vehicle can absorb. If this threshold is exceeded, which is often the case in high speed crashes, then safety features such as seatbelts and air bags are less able to reduce the impact of a crash, which in turn threatens the safety of the occupants inside.16 Similarly, the impact of a relatively small increase in speed can have detrimental results in a collision. According to an article by the Governors Highway Safety Association (GHSA), “if a vehicle traveling 40 mph in a 30 mph zone collides with another vehicle, that 10 mph difference translates into a 78% increase in collision energy”.17This can mean the difference between life and death when involved in a motor vehicle crash. External influences play a major role in developing the behaviour of young drivers. The ‘need for speed’ has become a common trend in the media. For instance, several fast paced car movies are popular among the younger demographic (E.g., Fast and the Furious, Gone in 60 Seconds, Drive) which glorify the fun and excitement of speeding and racing. There are rarely any repercussions faced by the actors in these movies (such as death, jail time), giving young drivers the impression that the negative consequences of speeding are unlikely. Another important influence is passengers of similar age to the young driver (such as friends or a significant other). Of the young passengers who were killed in speed-related crashes between 2002 and 2004, 80% were in a vehicle with a driver of the same age.21 Passengers can distract or disrupt a driver through conversation or music or by verbally encouraging them to perform dangerous moves, such as speeding. Even if the passengers remain silent, the fact they are in the vehicle can be enough to influence the driver.22 Whether it is a young male trying to impress his girlfriend by driving aggressively or a young female speeding in order to appear adventurous in front of her friends, the presence of young passengers can cause young drivers to behave differently than they would if they were driving alone. The cost to society associated with speeding is one that cannot be overlooked. In the U.S. every year, the economic cost of speeding is estimated to be about $40.4 billion. That is equivalent to $1,281 per second.23 Reducing the number of crashes related to speeding could greatly reduce the cost to society, allowing that money to be put to better use as well as keeping our roads safe. It is common for people to overestimate their skill as a driver and many drivers assume they can handle themselves better while speeding than other drivers on the road. This is why speeding is an issue that concerns drivers but they are still comfortable speeding themselves. Drivers also assume speeding will significantly reduce the amount of time it takes to get to their destination, which isn’t necessarily the case.25 For example, if a driver needs to get to a destination 40 km away, and the speed limit is 70 km/h then the journey will take 34 minutes. If the driver decides to speed and drive 80 km/h, increasing their risk of crashing by at least 60%, then they will get to their destination in 30 minutes.26 If drivers were aware of this, they likely would conclude that shaving a meagre four minutes off of travel time is not worth a 60% increase in their chances of crashing, resulting in potential injury or death. In a focus group conducted in the United States, teen drivers were asked why they speed. Teens did not actually consider driving five or ten miles (up to 15 km/h) over the speed limit as speeding. One reason they gave for speeding was to keep up with traffic, which they claimed was something their driver education teacher told them to do. Others said because they were late, that it gave them a rush or that the speed limits are too low. They justified their behaviour by pointing out that they only sped when there was no one else on the road and they considered themselves skilled enough to handle driving their vehicle at high speeds. Other provinces take speeding seriously as well. Quebec has doubled its fines for any driver who is considered to be ‘excessively speeding’ (for example, travelling 90 km/h in a 50 km/h zone would result in a $528 fine and six demerit points).30 British Columbia speeding fines range from $138 to $483 with three demerit points given31 and Prince Edward Island’s range from $100 to $1,00032 based on the severity. When asked about the extent to which they agree with the use of various measures for dealing with the issue of excessive speeding, 66% of Canadians agreed that speeding should be a higher priority for enforcement efforts and 46% agreed that the penalties for speeding should be equal to those of drinking and driving.33 These results suggest that Canadians want speed laws to be more strictly enforced. The desire for stricter enforcement is consistent with the finding that a majority of drivers are greatly concerned with the issue of speeding. Project E.R.A.S.E. (Eliminate Racing Activity on Streets Everywhere) was developed over 15 years ago in Toronto, Ontario to address the problem of street racing. Officers from 22 different police services, the Ontario Ministry of Transportation and the Ontario Ministry of Environment have collaborated to target the issue. The goal of the campaign is to change driver behaviour through education and strategic enforcement, which will reduce the instances of street racing and other aggressive driving behaviours. The program highlights how innocent people who are uninvolved in the activity of street racing are killed due to street racing every year (45 deaths since 1999). nformation on Project E.R.A.S.E. can be found at www.yrp.ca/erase. Another campaign, SMARTRISK, strives to decrease speeding by targeting new drivers before and during the learning process of driving so they can develop safe driving habits at the outset. This is achieved through school or community presentations that highlight the terrible consequences of aggressive driving and unsafe behaviours to avoid on the road, such as speeding. SMARTRISK responds to the notion that teenagers believe they are invincible and unstoppable. The initiative hopes to help young people discover that their passion for living is worth more than reckless impulsiveness. The message is presented in an upbeat and positive manner that encourages young people to have fun and take risks – but smart risks. Information on the SMARTRISK campaign can be found at www.smartrisk.ca. Canada is not the only country that is concerned with reducing the problem of speeding. Alongside many other international campaigns, Australia has released several clever and informative campaigns to target speeding drivers. One such campaign, Enjoy the Ride, has produced several television commercials and radio advertisements aimed at demonstrating that speeding is not worth the risk, and that slowing down is actually beneficial in many ways. Beirness, D.J., and Simpson, H.M. (1997). Study of the Profile of High-Risk Drivers. TP-13108. Ottawa, Ontario: Transport Canada, Road Safety and Motor Vehicle Regulation. Blakey, L.T. (2003). Red-light cameras: Effective enforcement measures for intersection safety. Institute of Transportation Engineers 73(3): 34-43. Canadian Council of Motor Transport Administrators (2008). Road Safety Vision 2010: Progress Report. Ottawa, ON: CCMTA. De Waard, D. Rooijers, T. (1994). An experimental study to evaluate the effectiveness of different methods and intensities of law enforcement on driving speed on motorways. Accident Analysis and Prevention. 26(6): 751-765. Department of Justice Canada. (2012). The Criminal Code of Canada. Retrieve from: http://laws-lois.justice.gc.ca/eng/acts/C-46/FullText.html#h-82. Diamantopoulou, K., Hoareau, E., Oxley, P., Cameron, M. (2003). The Feasibility of Identifying Speeding-Related and Fatigue-Related Crashes in Police Reported Mass Crash Data. Monash University Accident Research Center. Report #: 197. Ferguson, S. A. (2013). Speeding-related fatal crashes among teen drivers and opportunities for reducing the risks. Governors Highway Safety Administration (GHSA). Fischer, P. (2013). Promoting parent involvement in teen driving. Government Highway Safety Association. Washington, DC. Goldenbeld, C. van Shagen, I. (2005). The effect of speed enforcement with mobile radar on speed and accidents: A evaluation study on rural roads in the Dutch province Friesland. Accident Analysis and Prevention. 37(6): 1135-1144. Governors Highway Safety Association (GHSA). (2012). Survey of the States: Speeding and Aggressive Driving. Government of Ontario (1990). Highway Traffic Act. Service Ontario E-Laws. Retrieved From: http://www.search.e-laws.gov.on.ca/en/isysquery/869fa199-c621-4d65-849a-0f2a96b6beb5/1/doc/?search=browseStatutes&context=#hit1. Government of Prince Edward Island. (2012). Highway Safety Act. Retrieved from: http://www.gov.pe.ca/law/statutes/pdf/h-05.pdf. Horvath, C., Lewis, I., Watson, B. (2012). Peer passenger identity and passenger pressure on young drivers’ speeding intentions. Transportation Research Part F. 15: 52-64. Insurance Corporation of British Columbia (ICBC). (2012). Fines and penalty points for B.C traffic offences. Retrieved from: http://www.icbc.com/driver-licensing/tickets/paying-disputing/chart-offenceswithfines. National Highway Traffic Safety Administration (NHTSA). (2006). Teen Unsafe Driving Behaviours: Focus Group Final Report. DOT HS 810 670. U.S Department of Transportation. Washington, DC. Peer, E. (2010a). Speeding and the time-saving bias: How drivers’ estimations of time saved in higher speed affects their choice of speed. Accident Analysis and Prevention. 42(6): 1978-1982. Peer, E. (2010b). Exploring the time-saving bias: How drivers misestimate time saved when increasing speed. Judgement and Decision Making. 5(7): 477-488. Transport Canada. (2007). Transport Canada: Driver Attitudes to Speeding and Speed Management: A Quantitative and Qualitative Study. Final Report, TC-1002461. Transport Canada. (2008). A Quick Look at Speeding Crashes in Canada. Road and Motor Vehicle Safety. Retrieved from: http://www.tc.gc.ca/eng/roadsafety/tp-tp2436-rs200807-menu-158.htm. Transport Canada. (2011). Road Safety In Canada. Road Safety and Motor Vehicle Regulation. Retrieved from: http://www.tc.gc.ca/eng/roadsafety/tp-tp15145-1201.ht m#s32. Vanlaar, W., Robertson, R., Marcoux, K. (2008). The Road Safety Monitor 2007: Excessive Speeding. The Traffic Injury Research Foundation. Ottawa, Canada.